*partial, in this case, seems to refer to the interesting parts of the government. Please do not link to these, as they are not intended to be an archival source and will be taken down once the government is again fully functional. Today is the 100th anniversary of the death of my grandmother, Anna Crandell Robson, at the age of 33. She died of influenza only five days after her husband, Findlay Robson, and seven days after Findlay’s brother Neil. The death of Anna (usually called Annie) orphaned my uncle Fremont (age 5), aunt Pat (2), and mother Mary (15 months). Anna grew up in Lindsay, Ontario, the eldest of five children of Fremont Crandell and Irene Fee. She was the granddaughter of Captain George Crandell, who was well-known in the area as the operator of a number of steamboats that operated in the Kawartha Lakes area of Ontario at the time. Prior to their marriage in 1910, Annie had worked at Flavelle Flour Mills, at the site of the mill ruins in Lindsay, Ontario. Since Findlay was in the grocery business, it is likely that they met through that connection. They moved to British Columbia about 1913, where all three of the children were born. Her younger sister, Agusta (“Gussie”) lived in Calgary, Alberta, the wife of Charles Elliott, a Canadian Pacific Railway employee. Gussie came to Cranbrook to take care of the children at some point (the timing is uncertain, but perhaps before Annie passed). After Annie died, she reportedly had planned to adopt the children; she and Charles had none. However, Gussie also contracted the flu, and died on November 14 at the age of 26. Another relative, perhaps Annie’s mother, came to Cranbrook to retrieve the children and bring them back to Toronto, where they were raised by the families of two of Findlay’s brothers. The family was thus devastated by the deaths from influenza of four young adults between ages 26 and 37. Today is the 100th anniversary of the death of my grandfather, Findlay Robson, at the age of 37. Findlay (sometimes spelled Finlay) and his wife Anna (Crandell) Robson lived in Cranbrook, British Columbia, where he was the manager of Cranbrook Jobbers, a wholesale grocer. They had three children, Fremont (age 5), Pat (2), and my mother, Mary (15 months). Findlay grew up in Fenelon Falls, Ontario, about 100 miles northeast of Toronto. His father, William Lithgow Robson, ran the local grocery and Findlay got his start in the grocery business there. Findlay and Anna were married in 1910, and in about 1913 they moved west to British Columbia. Findlay died of pneumonia that was caused by the great influenza pandemic that year. Newspaper reports said that Cranbrook was hit hard by that flu outbreak; the papers were operating with a reduced staff because of the number of people down with the flu. 100 years later, we have the benefit of a much better understanding of what causes influenza and the availability of flu vaccines that, even if not 100% effective, can make the difference between a severe case of the flu and a mild one. I make a point of getting a flu shot every year, both to keep myself from being down with the flu, but also to honor my grandparents’ memory. I recommend the same to everyone. Spoiler alert: Anna died of the flu a few days later. I will post another article about her on that anniversary. Recently there has been a fair amount of discussion about what the minimum acceptable length of passwords should be. NIST SP 800-63B sets a minimum of 8 characters. Some people think the minimum should be considerably more than that, perhaps 16 characters. The following is some rationale for why 8 is a reasonable minimum. A 2014 research paper was a significant factor in informing this guideline. As discussed in Section 3.2, guessing attacks on passwords can be categorized into online and offline attacks. Online attacks are limited by available bandwidth, response time of the verifier, and hopefully by active throttling of the number of guesses allowed (as specified in SP 800-63B section 5.2.2). Offline attacks, where the attacker has been able to obtain a password database (hopefully salted and iteratively hashed), can make many more guesses, with guessing rates in excess of 1 billion guesses per second depending on the attacker’s hardware capabilities. There isn’t anything in between: either the attacker has a password database to use and mounts an offline attack, or they don’t and mount an online attack. 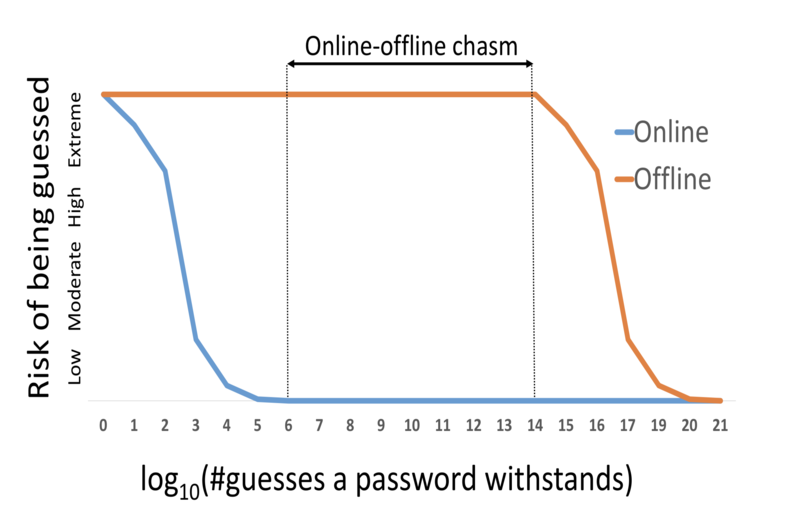 As a result, there is a significant range in password lengths, shown in Figure 2 of the paper (reproduced above), where passwords are long enough to be resistant to online guessing attacks, but are not long enough to be resistant to offline attacks. Within this range, increasing the minimum password length adds to the burden on users, but does not significantly increase security. While SP 800-63B does not attempt to estimate entropy (or the estimated number of guesses required) for a given password length, the current guideline of 8 characters exceeds the length needed to protect against online attacks, particularly since the paper doesn’t assume intentional rate limiting by the verifier. However, a considerably longer minimum password length, probably at least 16 characters, would be needed to protect against offline attacks, and that would increase with computing speed. Users do predictable things when subjected to onerous authentication requirements, such as the common behavior to append an exclamation point to their password when required to use a special character. Rather than impose an onerous length requirement (which might cause them, for example, to just use their shorter password twice), the decision was made to set the minimum password length to be resistant to online but not offline attacks. 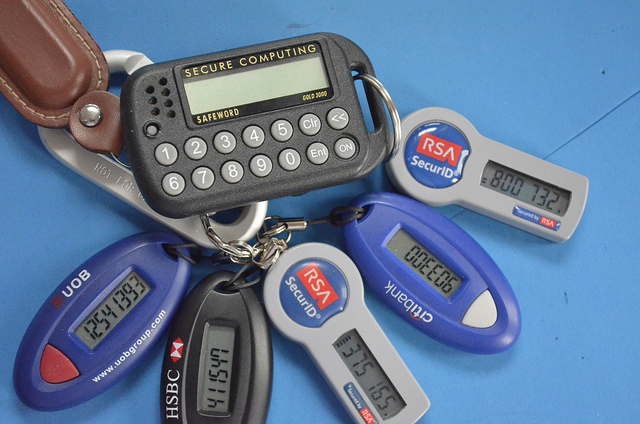 Instead, the burden was placed on the verifier: SP 800-63 section 5.1.1.2 calls for verifiers to store memorized secrets in a form that is resistant to offline attacks, including use of a salted key derivation function and also suggests an additional keyed hash with a secret key that is stored separately. SP 800-63-3, which contains guidelines on selection of the Authenticator Assurance Level (AAL), calls for two-factor authentication in a number of situations where it has not typically been used. In particular, Executive Order 13681 requires federal agencies to use two-factor authentication whenever a user’s personal data is being released. This is largely in recognition of the limited security that passwords can provide due to not only the guessing attacks discussed above but also other threats such as key loggers. Given the modest security that can be achieved, increasing the minimum password length would be an inconvenient and incomplete solution to authentication security. Note: While I am a co-author of NIST SP 800-63-3 and SP 800-63B, I am an independent consultant and the above discussion is my opinion only and does not necessarily represent the position of the National Institute of Standards and Technology. Illustration above is from reference . Florêncio, Dinei, Cormac Herley, and Paul C. van Oorschot. “An Administrator’s Guide to Internet Password Research.” Usenix LISA, November 2014. http://research.microsoft.com/apps/pubs/default.aspx?id=227130. One of the problems with the way that passwords are usually verified is that all of the information needed to do the verification is in one place. The password table contains everything that is needed (salt + hash) to verify a password. So if that table is compromised, and that seems to happen a lot, most users are vulnerable because hash cracking technology is, sooner or later, going to crack the vast majority of those passwords by dictionary attack and brute force. Efforts to defeat this have mostly centered around making it harder for the crackers by using iterated memory- and time-intensive algorithms to do the hashing. Another (an additional) approach is to also hash using a secret value that is stored securely. 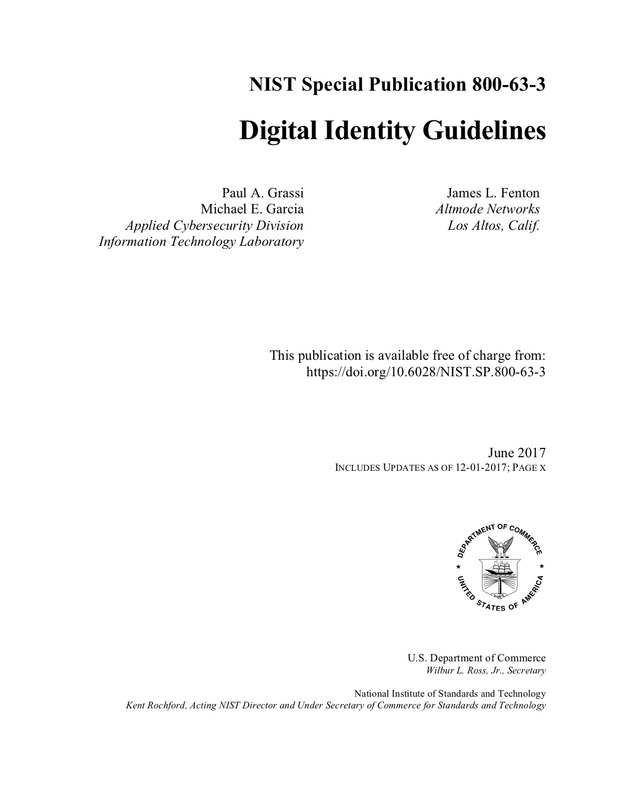 This is recommended in NIST SP 800-63B, Digital Identity Guidelines: Authentication and Lifecycle Management, in the last paragraph of Section 5.1.1.2. 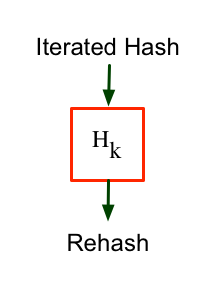 This keyed (or “secret salt”) hashing step can be isolated from everything else and treated as a black box that accepts password hashes and outputs a rehashed value. The premise is that it’s easier to protect a secret in a black box than it is to protect a database of hashes and salt values that is used directly by the verifying application. With the additional use of a secret-keyed hash with a sufficiently complex key, it is impractical to dictionary attack a database of hashed secrets unless the key is known. Hashing passwords with individual random salt values is still essential. Without that step, it might be possible for an attacker to create fake accounts with known passwords, then compromise the password file and see if any of those hash values appear elsewhere in the database. I am also a believer in defense-in-depth, so I also recommend continued use of iterated hashing so that security is no weaker than the current situation if the key is somehow obtained by an attacker. Some people have commented that this requires the use of a hardware security module (HSM). While HSMs are the ideal black boxes and provide excellent protection for the key, they can be expensive to obtain and deploy, especially in cloud environments. As an alternative, I have written a sample application, rehash, that implements a very simple web API to accept a hashed password, hash it with a private key, and return the result. The rehash application should run on a machine separate from that doing the password verification, and separate from anything else that could compromise the secret key. The rehashed password would be stored in the password verification table and, when a password is entered, the iterated hashed password is rehashed and that value checked against the table. I have huge respect for the people in the password cracking community that I have met. They have done groundbreaking work in understanding user behavior and using that to optimize the search for passwords in their cracking process. But it is time that we implement something that makes this sort of cracking entirely impractical, rather than just ratcheting up the work factor for them. I welcome any comments on the rehash application, either through comments here or (perhaps better) by opening an issue on GitHub. We rose and checked out of our hotel somewhat early this morning because we had a reservation at the Neon Museum, a collection of lighted signs of Las Vegas’s past. The museum, located just north of downtown Las Vegas, provides guided tours of their collection during the morning and evening (mid-day being too hot). Our 9 am tour was led by a UNLV history major who was definitely into the history and stories behind the signs, which added a lot to our appreciation of the collection. As in Silicon Valley, “history” in Las Vegas does not necessarily mean “old” in the usual sense. We were amused that some of the signs in the collection had been put up in the 1990s and were already obsolete — all happening since we were married in 1991. Leaving Las Vegas, we drove down I-15 to Barstow, stopping for lunch in Baker. We then turned west to Bakersfield. I had always been curious about signs for California City along that route, and it wasn’t very far out of our way, so we drove through there (partly because there was allegedly an ice cream shop there). California City is a planned city in the desert north of Edwards AFB; it wasn’t very successful although it seems to have some new development due to employees at Edwards. It has that “planned community” look, similar to communities like Sun City, Arizona, but generally looking less prosperous. We found the promised ice cream shop, but it appeared to be out of business. From Bakersfield, we continued north on Highway 99 to Visalia, our planned stop for the night. We had considered trying to visit Sequoia National Park on the way home (which prompted this choice) but unusually warm temperatures, along with the start of the Labor Day weekend, convinced us that we should visit another time. Nevertheless, Visalia was a surprisingly nice small city in California’s Central Valley. There were many good restaurants in the downtown, as well as theaters, concert venues, and stores. We counted about six bridal shops. We don’t have any idea why there are so many; maybe Visalia is the wedding dress capital of the Central Valley. We decided to take a short walk for breakfast. The Yelp app said there was a good breakfast place just a few blocks away. Along the way, I took a picture of an empty corner, somewhat as a gag: “Standin’ on a corner in Winslow, Arizona…”. But when we came to the next corner, there were statues standin’ in front of a large mural celebrating exactly that song lyric. Apparently I had just picked the wrong corner. A short drive from Winslow was the Meteor Crater, which Kenna had previously seen but I had not. The admission fee gave us access to not just the crater but to a well-maintained museum dealing with a number of related topics, such as comets, asteroids, and the extinction of the dinosaurs. While the admission fee ($14 each or $12 for seniors) was not insignificant, it was a good value in terms of the work that had gone into presenting the information to us. The view of the crater was impressive as well. Continuing past Prescott, we stopped in Williams, Arizona for lunch. Williams is the southern terminus of the Grand Canyon Railway, which we have twice previously taken. Williams seems to be thriving from the presence of the railway. We proceeded to Las Vegas through a couple of rain showers. We decided to take the route on the western side of the Colorado River, through Laughlin. Our room for the night was at the Platinum Hotel, a non-smoking and casino-free hotel on Flamingo that I had stayed at on previous trips for BSides Las Vegas and DEFCON. For a relatively modest price, we had a large suite with a full kitchen. We took a walk around the nearby portions of The Strip before stopping for a small dinner at Jimmy Buffett’s Margaritaville restaurant. The restaurant earns its name; our margaritas were tasty but strong. I woke in the middle of the night to a dazzling display of stars. The previous evening’s clouds had left, and the moon had set, so I got to see the stars as they were visible to most people prior to the invention of the light bulb. We all rose just before sunrise to see the sun again reflect off the poles. It wasn’t quite as picturesque as the previous evening because the clouds were gone, but very nice nonetheless. After breakfast, we took a walk around the perimeter of the lightning field; judging from the path in the field, this seems to be a popular activity for visitors. There was surprising variation in the plant life in some areas, including a section of flowers that reminded us of the flower field in The Wizard of Oz. I brought my GPS on the hike, and recorded the locations of each of the poles we walked along to compare against Google Earth after the trip. About 11 am, Kim returned to retrieve us and we left the solitude of the Lightning Field. We returned to Quemado, where Dave’s Tesla had been charging — slowly — while we were at the Field. Being about lunchtime, Kenna and I opted to drive back to Pie Town for lunch with the rest of the group, where Dave was able to get some more charge on the car at the RV park. After lunch, we said our good-byes and headed west, back through Quemado and into Arizona. We drove next to Petrified Forest National Park, which neither of us had visited before. The Petrified Forest is, of course, nothing like a forest — it’s basically desert with calcified tree trunks scattered around. The trunks are colorful, due to impurities such as iron and manganese that are part of the millions of years of calcification. The geology of the Petrified Forest was also interesting in other ways. The hills had very distinct and colorful layers of soil that were deposited as the area migrated from close to the equator to its current position. There is obviously quite a story that a geologist could tell about this. Proceeding out the north exit from the park, we were now on Interstate 40, the old Route 66. It was quite a change in culture from the rural roads we had been traveling the past couple of days. I-40 had extensive truck traffic, but the BNSF railway that paralleled it was also very active, with long trains hauling shipping containers in both directions. We were thankful for the trains, realizing that all of those containers could be on I-40 with us. We had considered pressing onward to Flagstaff, but decided to stop at Winslow, partly due to a recommendation we received from David and Kelly to stay at La Posada, one of the classic “Harvey House” hotels there. The hotel had been extensively restored; our room had elegant wood floors and area rugs, leather furniture, and a small reading library of its own. We decided to eat dinner at the Turquoise Room, the hotel’s similarly classic restaurant. Kenna and I had a somewhat dressy dinner there (at least by road trip standards), and it was excellent.